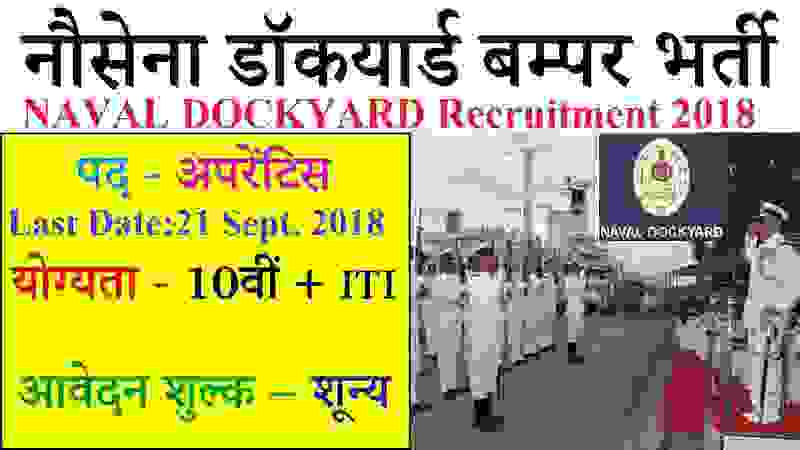 Naval Dockyard, Mumbai invites online applications on the following website www.bhartiseva.com from all qualified Male and Female applicants in various designated trades. A notification is out from Naval Dockyard Recruitment department related to this recruitment process and they said that they are going to filling up total 318 posts through this recruitment process. We also come to know about this notification from the Naval Dockyard website and share this information with you readers. So those who are wishing to apply these Government jobs should apply online for this recruitment process 2018. To know more about this Naval Dockyard recruitment process read the whole article carefully till the end. What are the various Eligibility Conditions? (a) Educational Qualifications: The minimum educational qualification for a person to undergo apprenticeship training in Designated Trades shall be 10th class passed (in accordance with Apprentice Act 1961) with a at least of 50% marks in 10th class examination along with examination passed in the relevant trade with aggregate of 65% marks. (c) Minimum Physical Standards. The Height of the candidate should be 150 cm, Weight not less than 45 Kg, Chest size without expansion should be 5 cm, Eye sight of the applicants must be 6/6 to 6/9 (6/9 corrected with glasses)/ external & internal organs to be normal. (d) Previous Training. Candidates who have already undergone or are currently undergoing Apprenticeship under Apprentice Act - 1961 in any Govt / Public Sector / Private Industrial organisation are not eligible to apply for the current enrolment. What is then Process for Selection? The Centre of examination will be Mumbai only. The exact date, time and venue of written examination would be intimated to candidates through online call up letters on their registered email IDs only. Candidates are advised to check their email regularly. All Indian fresher candidates can apply for these Government jobs in Mumbai by paying ZERO application fee. No fee is required for applying this recruitment process. 21st Sept. 2018 is the Last Date for applying.